When it comes to direct marketing, no one likes being spammed. 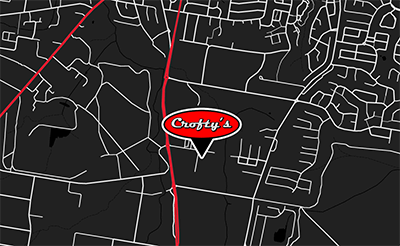 At CROFTY'S AUTO & TYRES, we may use your personal information to send you advertising that is customised to your interests, characteristics or general location. We do what we can to keep your personal information up to date and accurate at all times as this allows us to deliver a better service to you. If any information we have for you needs to be corrected, you can contact us via james@btcnowra.com. We take active steps to protect the personal information we hold against loss, unauthorised access, use, modification or disclosure, and against other misuse. These steps include password protection for all of our IT systems. While we cannot share with you details of our entire security system for safety reasons, if you have any questions, you can always contact us at james@btcnowra.com. At CROFTY'S AUTO & TYRES, we do everything we can to keep your personal information accurate. If you find that any information we hold about you is incorrect, you can contact us at james@btcnowra.com, or as per the contact details below and we will endeavour to assist you with your questions. Please bear in mind that under Australian privacy laws, there may be situations where we cannot provide access to such personal information. For instance, if it would reasonably affect someone else’s privacy or may pose a threat to someone’s life, health or safety. If you have any complaints or feel that there has been a breach of the Australian Privacy Principles, or a registered APP code, you can contact us at james@btcnowra.com or via another option below.